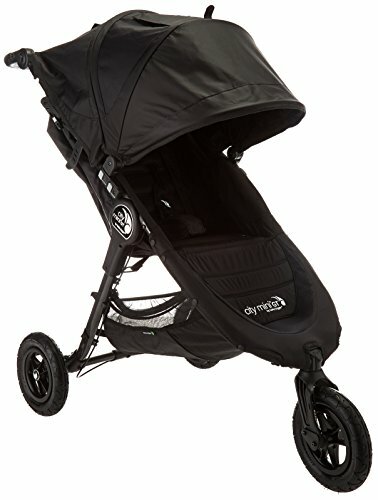 I have always loved the City Mini in Baby Jogger’s lineup of outstanding strollers, so when the City Mini GT rolled out, I was really excited to take it for a test run. The City Mini GT stood up to my expectations and more. It is basically a souped-up version of the City Mini with a few more bells ‘n’ whistles. 0.1 What is the difference between the City Mini and the City Mini GT? 2 What’s the performance like? 3 Tell me about the seat. 9.1 Where can I buy the City Mini GT? What is the difference between the City Mini and the City Mini GT? The most obvious difference is the all-terrain tires. Sealed ball bearings give it much smoother, easier maneuvering. No flats, though! These are forever-air poly filled tires that give you the smooth ride without having to keep an air pump around. City Mini GT can accommodate bigger kids. The weight capacity is increased to 65 pounds, whereas the City Mini can take up to 50 pounds. You’re going to get more padding on the seat with this model. City Mini GT seat is 2″ deeper with a 1½” taller seatback and 3″ more clearance from the top of the seat to the opened canopy. For parents, the City Mini GT has an adjustable height handlebar ranging from 30-43½” from the ground so that everybody is comfortable pushing it. And instead of a foot pedal brake, the City Mini GT uses a handbrake on the handle. Because of the bigger, air-filled tires, the GT weighs 4 pounds more than the City Mini. Still, at only 21 pounds, it’s a lightweight option. 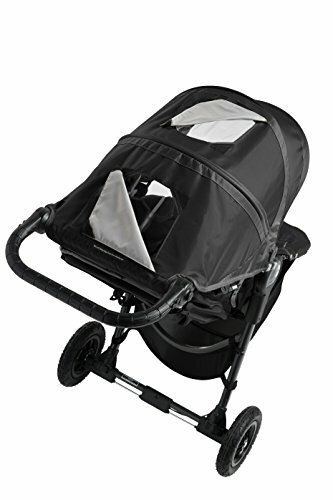 However, despite the name, the Baby Jogger City Mini is not a jogger stroller, and it is not meant to be used while jogging. But it will handle those dirt trails and bumpy boardwalks like a champ. For a stroller that holds up to 65 pounds and has forever air tires, the Baby Jogger City Mini GT is still quite lightweight, a deal-breaker for many parents shopping for just the right one. At 22½ pounds, it’s compact enough to fold and tote around without hassle. I just love how this product is very easy to steer and it does offer a smooth ride, even on bumpier terrain, which is what it’s made for! The City Mini GT has a swivel front wheel that ensures precise maneuverability, and the swivel front wheel can be locked into place for long distance strolling. 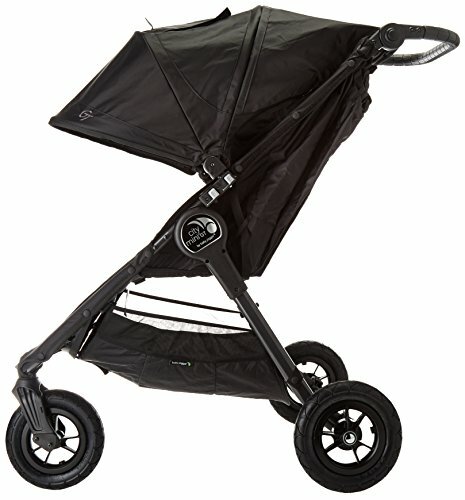 Jane from Cambridge mentions in her 4-star review that her GT handles well on bumpy sidewalks, and is great for long walks. The 8½ inch, quick release forever air tires with sealed ball bearings maintain excellent maneuvering, even if dirt or mud gets in there. The tires are excellent for lots of types of ground. One review from 2016 was from someone who took their City Mini GT to various Italian cities like Florence and Sienna, and it performed admirably over the old cobblestone streets. This reviewer also remarks that it’s very easy to push and maneuver over gravel in parks. Tell me about the seat. I love the big seat! 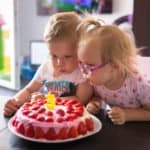 It has a tall back and it is wider and the seat depth, where their knees bend, is 10 inches, which gives your big child room to sit back comfortably. Since it holds up to 65 pounds, then yes, the seat needs to be bigger. The recline goes nearly flat and is done using a one-handed strap system. Find just the right position. And because the deep recline is nearly flat, it is suitable to place a newborn right on the seat if you don’t want to use a car seat. The Baby Jogger City Mini GT is comfortable and safe because it has an adjustable five-point safety harness that fits snug and secure with your growing baby. It is so easy to adjust them, too. No rethreading! Just clip in the shoulder height you want. A buckle cover and shoulder pads provide more comfort as your baby is seated. The seatback is firm to give better support and proper posture so your child doesn’t slouch. Velcro tabs also pull the seat forward an additional two inches so that your child can sit more upright at snack time or see outside. The City Mini can accommodate an infant car seat when you purchase a car seat adapter It can hold brands such as Peg Perego, Cybex, Britax, Maxi Cosi and most Graco seats. See a list of all supported car seat brands here. Just click it in the universal accessory mounting bracket and you’re good to go! All Baby Jogger strollers use a patented Quick-Fold Technology that allows parents to fold it in one easy step. 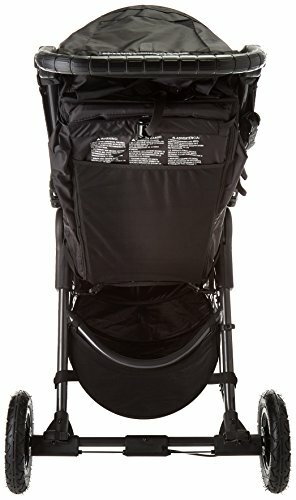 For sure this is a main selling feature that parents look for when selecting a stroller and Baby Jogger was the first to have this kind of fold. One hand. Pull up the strap in the seat crevice. BOOM! Folded. A removable auto lock holds the frame together for convenient storage. The video above shows you just how simple it is that even a kid can do it! Then if you need even more compact space, just pop the tires right off. Clearly, the canopy is the main sun and wind protector. Just look at how well it gives plenty of coverage from the photo at right. In fact, it is so big that it has two large peek-a-boo windows to check in on your child. Retract the hood a bit and you still have a window to see through. I love it! This product has a seat top that is ventilated with mesh, providing air circulation on those warm days. For cold weather, a retractable cover encloses the mesh, keeping warmth inside the seating enclosure for your baby. This is something I had to get used to, but I got it quickly: the parking brakes are on the side of the frame by the handle, not foot-operated. Simply flip the lever to engage both wheels to a complete stop, and flip it back to disengage. Moms like this because shoes no longer get scuffed and using a foot brake can sometimes feel cumbersome. Tall parents will rejoice knowing that this stroller has an adjustable height handle bar! From the shortest height at 30″ all the way up to 43½” from the ground, you’re going to find a position that is just right. The Baby Jogger City Mini GT has a storage basket under the seat, and another mesh storage pocket on the back of the seat. The under seat basket is big enough to fit a huge diaper bag. The rear axle bar is curved so that you can get your stuff in and out of the basket easily. I also like that the basket has a bit of give to it so that if you need to get something from the side, simple pull the storage basket out a little for side access. Another storage option is a large mesh pocket at the back of the seat. Keep all your essentials at arm’s length. This product has a patented universal accessory mounting bracket, which allows parents to add stroller accessories as needed. I’ve seen many City Minis and Mini GTs with either a padded bumper bar for children to hang on to, or with a snack tray so little ones can nibble and grab a sippy cup. Either one is really nice to have for your little one, and makes outings so pleasant. Parents, if the back storage pocket isn’t enough and you want a drink holder (a MUST HAVE for many!) then you’ll want to get the parent console. It has a place for your drink as well as additional smaller pockets and compartments to fit your little essentials such as keys, lip balm, cell phone, little toys or pacifier. I mean the list is endless! A rain shield protects your child not only from rain, but also really cold days and from the wind, too. What I like about the rain shield is that it zips away so that you have access to your child in and out without having to remove it. The shield is well ventilated with holes on each side. 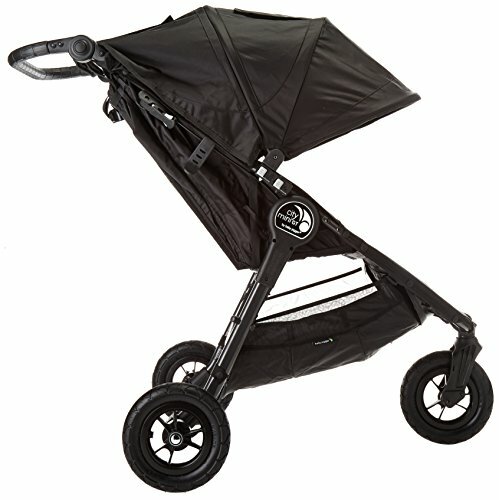 Across a half-dozen internet retailers, the Baby Jogger City Mini GT is receiving consistently high reviews. The sturdy all-terrain smooth riding tires and comfort for both parent and child, and the stroller is top quality with superb handling. Many reviews cite the small and compact fold as a huge plus in their positive comments. It fits well in car smaller car trunks or those that already have stuff in them like grocery bags. Another common feature that parents talk about is the seat recline: they love how it reclines nearly flat! The adjustable-height handle is a winner with partners who are taller or shorter and each feels comfortable strolling. And the large sun canopy was also mentioned in numerous reviews with parents appreciating the full coverage and weather protection. Not many downfalls to the Baby Jogger City Mini GT. However, reading through the reviews, one remark I’ve seen on a few occasions is that parents would like the under seat basket to be a bit larger. A few reviews mention that they wish the seat would sit more upright for their older children. Where can I buy the City Mini GT? 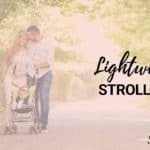 My favorite place to buy strollers is on Amazon. While the current year’s models are priced the same across most all web retailers, you will find that the price will start likely start to fall as the year goes on and chances are you’ll find the best deal there. I also like shopping on Amazon because I can also buy a couple of other unrelated items along with my big purchase. It’s really convenient that way! Can you picture it now, you’re enjoying a brisk walk on your favorite route, taking along your sweet little one. You get to share this time together, and you feel really glad you chose the City Mini GT to bring it all together.